Is 1:11-15 Religious but not Changed. Isa 1:11 The LORD asks, “What do your many animal sacrifices mean to me? I’ve had enough of your burnt offerings of rams and enough fat from your fattened calves. I’m not pleased with the blood of bulls, lambs, or male goats. Isa 1:12 When you appear in my presence, who asked you to trample on my courtyards? Isa 1:13 Don’t bring any more worthless grain offerings. Your incense is disgusting to me, so are your New Moon Festivals, your days of worship, and the assemblies you call. I can’t stand your evil assemblies. Isa 1:16 “Wash yourselves! Become clean! Get your evil deeds out of my sight. Stop doing evil. All Religious but no profit or Godly Change. All the sacrifices and burnt offerings but God says, “What are they to me?” They were strict in their rituals and religious duties but all this was no use and would not be accepted unless it was an offering from the heart as God demanded RIGHTEOUSNESS. Notes : They would frequent the temple in Jerusalem where the temple and the Holy Presence of God was between the Cherubim. This was the SHEKINAH or the GLORY of Yahweh of Israel. Who has asked this of you? They were supposed to present themselves there in the temple courts three times a year. 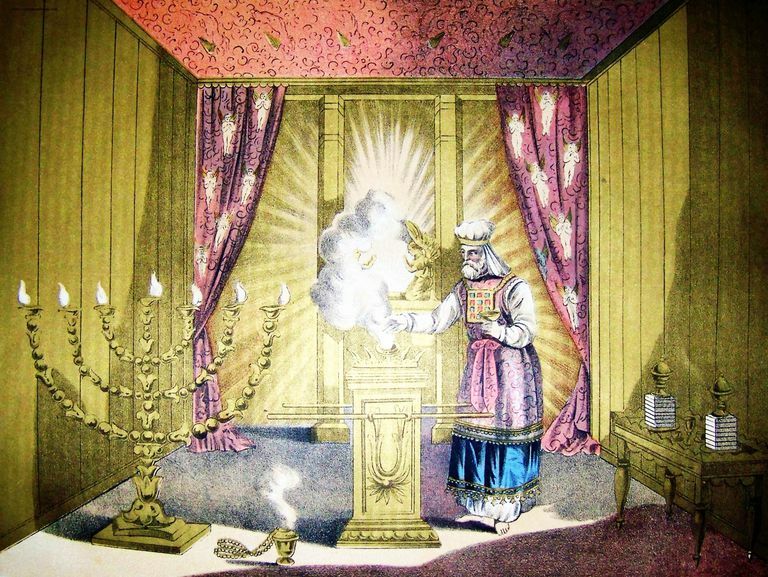 Only the priest could enter into the Holy Place the first room of the Temple but then the High Priest would enter the Holy of Holies but once a year on the day of Atonement. The people worshipped in the Temple Courts. To continually tread the Temple courts has the idea of profanation. These were but hollow heartless rituals. Matthew Henry comments They did not send others to offer their sacrifices for them, but came themselves to appear before God. They observed the instituted places (not in high places or groves, but in God’s own courts), and the instituted time, the new moons, and sabbaths, and appointed feasts, none of which they omitted. Nay, it should seem, they called extraordinary assemblies, and held solemn meetings for religious worship, besides those that God had appointed. Yet this was not all: they applied to God, not only with their ceremonial observances, but with the exercises of devotion. They prayed, prayed often, made many prayers, thinking they should be heard for their much speaking; nay, they were fervent and importunate in prayer, they spread forth their hands as men in earnest. Now we should have thought these, and, no doubt, they thought themselves, a pious religious people; and yet they were far from being so, for (1.) Their hearts were empty of true devotion. They came to appear before God (Isa_1:12), to be seen before him (so the margin reads it); they rested in the outside of the duties; they looked no further than to be seen of men, and went no further than that which men see. (2.) Their hands were full of blood. They were guilty of murder, rapine, and oppression, under colour of law and justice. The people shed blood, and the rulers did not punish them for it; the rulers shed blood, and the people were aiding and abetting, as the elders of Jezreel were to Jezebel in shedding Naboth’s blood. Malice is heart-murder in the account of God; he that hates his brother in his heart has, in effect, his hands full of blood. When sinners are under the judgments of God they will more easily be brought to fly to their devotions than to forsake their sins and reform their lives. The longsuffering of the LORD was now with all such worship. All their seasons of feasts in Jerusalem were just a Burden and annoyance to the LORD. They were a sham of a holy nation. – an abomination to God. Prayer is the means of mediation between man and God. But if the person is just full of sin God will not answer. Deu 9:18 Once again I threw myself down in front of the LORD. I went without food and water for 40 days and 40 nights because of the sin you committed. You did what the LORD considered evil and made him furious. Deu 9:19 I was terrified of the LORD’S anger and fury. He was so angry he wanted to destroy you. But once more the LORD listened to me.